"One for all and all for one". 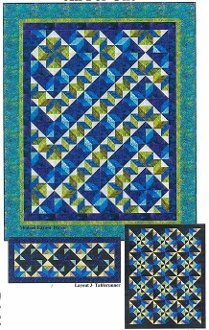 No we're not talking about the Musketeers, we're talking about how all the projects in this pattern are made from just one block pattern that is rotated for the many layout options. Easy piecing and Half-Square Triangles are the key. Choose from: table runner 40 x 16 inch, bed runner 80 x 32 inch, throw 50 x 62 inch, twin 71 x 89 inch, or queen 90 x 114 inch.